• Gen Con was fantastic for Palladium on every level. • Unbelievably busy. We were so busy, every morning started out with a bang, selling the limited edition figures. The hours afterward flew by in the blink of an eye. How busy could that have been? I dared some of the folks at our booth to time me to see if I could sit down for more than 30 seconds without having to get up to answer a question, sign a book, shake hands, chat with someone, or be part of a photo op. 29 seconds was as close as I came. That is NOT an exaggeration. Wild, eh? But I loved it. I enjoy being in the thick of things and talking with so many gamers. Feeling their excitement and enthusiasm recharges my batteries. And there was plenty of excitement. • The energy at Gen Con Indy was electric. Gamers were there to game and have fun. The exhibitors’ hall was constantly packed, and in my opinion, was the biggest and best Gen Con ever. Even better than the last couple of years, which were also outstanding. Wow. 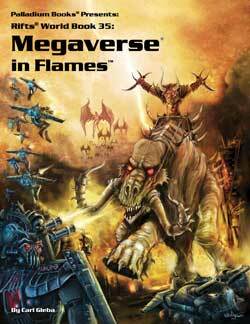 People are pumped up about Robotech® RPG Tactics™, Rifts® Northern Gun™ One and Two, Robotech® UEEF Marines Sourcebook, other Rifts® titles, Palladium Fantasy®, Heroes Unlimited™, Beyond the Supernatural™, and . . . well . . . everything. It was also nice to see so much excitement about Palladium Books in general. And not only are fans excited, but distributors too. I spoke with at least a half-dozen Palladium distributors, all of whom were thrilled with the range of upcoming releases. • My main disappointment, we were all so busy, I don’t think any of us ever saw the entire exhibitors’ hall. I know I didn’t. Nor were we able to visit very long with friends. I did manage to squeeze out 20 minutes with a number of dear friends, including Brom, Larry Elmore, Jolly and Barbara Blackburn, Dana Lombardi, Amy Ashbaugh, Glen Evans, Steve Bond, James and Diane Brown, Peter Hartman, and a few others. It’s always a delight hanging with such distinguished ladies and gents, and it was good to catch up with them. • Another disappointment – photographs. I have one other regret, I just realized after talking with Jeff and Wayne that we were so busy and distracted that we, ourselves, didn’t take as many photos of our booth and the new game pieces on display as we probably should have. Sheesh! There is an excellent presentation on CritToHit.com and I expect more will be popping up elsewhere. Gamerati photos and video. I guess it was a good thing then, that I had Ed Healy and the Gamerati crew document our presence at Gen Con 2013. Some photos are already on their Facebook page with more coming. • We easily signed a thousand books and chatted with hundreds and hundreds of fans. My thanks to the multitude of gamers who, as usual, made us all feel so welcomed and appreciated. Many of you have become friends we look forward to seeing at Gen Con once a year. It was great. • The watermelon man. Dan DeLuca, a long-time Palladium gamer and pal, surprised us with another cool carved watermelon. This one featured a Ley Line Walker. We put it out on the table for everyone to see and enjoy. I think it got almost as many photos as the Robotech® game pieces on display. • Books were flying off the shelves! We ran out of several titles and came very close to running out of many others (down to the last one or two, including RUE). • What was hot? Rifts®, the Rifts® Northern Gun™ One “Advance Prototype Edition” (available at the Palladium online store while supplies last; I think there are fewer than 40 copies left! ), Robotech® (especially the Macross Sourcebook in the 8½ x 11 inch size), The Rifter® #63, Dead Reign™, Heroes Unlimited™, After the Bomb® . . . heck, EVERYTHING was selling! 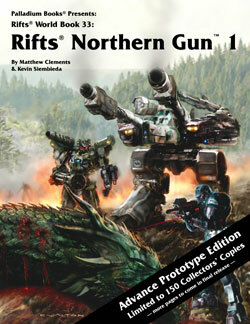 Rifts® Northern Gun™ One – Advance Prototype Edition was our best selling individual book title. 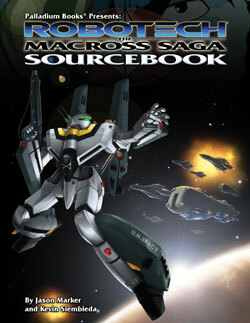 Robotech® Macross® Saga Sourcebook, in the 8½ x 11 size format, was a close second bestseller and only a few copies behind the NG-1 Prototype Edition. • What is the Rifts® Northern Gun™ One Advance Prototype Edition? A slick, print on demand book limited to a total of 150 copies. It presents the first 130 pages of NG-1 (background, setting, O.C.C.s, and some robots with art of some of what’s yet to come). $17.95 – Cat. No. 887AP – available only from the Palladium Books online store, and only while supplies last (available now!). Everyone who saw it at Gen Con loved what they saw. Note: NG-1 should be finished and in your hands in 3-4 weeks, depending on the printer’s schedule and how fast we can wrap it up. • The Palladium crew were nothing short of awesome. My heartfelt thanks to each and every one of them: Wayne, Jeff, Matt, Brandon, Sarah, Mike, Mark, Tom, Chuck, and Carmen. I also want to give a shout out to Seth Crofton for his help and insight. I’m glad to count him among my new friends. This was Jeff Burke’s first time working a Gen Con and he hadn’t attended a Gen Con in 10 years. Needless to say, he was blown away by all of it and worked his tail off. Jeff seemed to be everywhere and magically appeared whenever his help was needed. Mark Oberle is another guy who is always ready to do whatever needs to be done; what a guy. Madman Mike Leonard was a big help too, and always one to offer keen insight. It was good to see him getting along so well after his car accident last year. As for Matthew Clements, this smart, savvy and helpful gent is always a welcomed addition to all Palladium operations. Brandon Aten was another omnipresent asset. He ran three Rifts® games, some Robotech® demos and was a cheerful and helpful presence throughout Gen Con. His wife, the lovely Sarah Aten, was practically superhuman running one of the cash registers with Wayne Smith operating the other. Chuck Walton wowed everyone with his artistry and time. He chatted with fans, signed books and did spectacular commissioned pieces for several people. Heck, I don’t think Chuck ever left his table except to help out at the booth. Even feeling a bit under the weather, Carmen Bellaire was another dynamic Palladium maniac. We had three small demo tables going at the Palladium booth, but Carmen ran full-sized, 6x4 foot game table demos of Robotech® RPG Tactics™ in Hall C for five hours straight every single day. Then he came back to the booth to run demos there. Carmen co-authored the rules to Robotech® RPG Tactics™, so those who gamed with him really got the inside track. We all met Thomas Roache for the first time, in person, and immediately hit it off. There was so much demand for demos of Robotech® RPG Tactics™ that when Tom arrived on Friday, I walked him in a circle to introduce him to everybody, directed him to a demo table and said, “If you don’t mind, Tom, start giving demonstrations.” And he did. Tom was a real trooper. He ran Robotech® RPG Tactics™ demos at the Palladium Books booth non-stop. I think there is only one word for this dynamic individual: Awesome. Thanks, Tom. Oh, and in case those of you reading this don’t know, Tom Roache is the Robotech fanatic (and all-around good guy) who launched a friendly and positive online campaign that encouraged Palladium to consider making Robotech® game pieces. The rest is history. This was Tom’s first Gen Con, so the entire experience was a roller coaster ride. David Freeman from Ninja Division is another awesome guy and co-author of the Robotech® RPG Tactics™ game rules. He was doing double-duty at the Cipher Studios booth and Palladium Books. Dave swung by the Palladium booth to help run demos for an hour here and there as often as he could. Kai and Paul helped when they could, too. Thanks guys. It was Kai and his crew who made certain we had the Max Sterling battloid available at the convention, casting and packing up until the day before they left for Gen Con. John Cadice delivered the display pieces and a couple of Robotech® banners first thing Wednesday evening while we were setting up. • The Monster, Glaug-Eldare, and Queadluun-Rau were on display along with the Glaug, Phalanx, Tomahawk, and others pieces, but it was those first three that seemed to capture the most “oohs” and “ahhs.” Especially the Monster, which is a big, gorgeous and impressive piece. The Monster has always been one of my favorites and this rendition is a crowd-pleaser. I can hardly wait for its release, myself. • The convention special items: the Mecha of Max and Miriya, were smash hits. Ninja Division had originally intended to provide Palladium with 1,200 of each game piece, but the Ninjas just could not produce that many in time for Gen Con. In fact, for a nerve-racking while it looked like we would not have any Max VFs at all! Palladium implored Ninja Division to get us at least 500 of Max and Miriya. It took a Herculean effort by Kai and company, but they managed to get us the Max mecha just in time for Gen Con. (Thank you, gentlemen.) We didn’t get the news that they were able to pull it off until the Tuesday before Gen Con ourselves (cheering all around), and had them sent by FedEx so both pieces would be available at Gen Con. • The 300. Every morning, a line of gamers rushed to the Palladium booth as soon as the doors opened. With only about 500 of each of the Max and Miriya mecha, we had to limit the number sold to 125 of each item per day at Gen Con. That meant a frenzy at the booth and a big line of 300 people every morning! It took us a couple of days and the help of the Gen Con staff to get it all organized. But we did, and the chaos of Thursday and Friday mornings turned into smooth order by Saturday. Our thanks to the vast number of you who were patient and understanding. Our apologies to those of you who missed out on these convention exclusives. Maybe we’ll try to offer them again at another convention in the future. Game on. These are just some of the most notable highlights. There were more goings-on, laughs, and nice moments. We haven’t worked this hard at a Gen Con in years. There never seemed to be a moment’s rest and that’s the way we like it. Time flew by and it was awesome meeting so many of our friends and fans! We hope you had a wonderful Gen Con and that Palladium was part of what helped make it memorable. We got home Monday evening. We were all pretty tuckered out and dragging the next couple of days. We have spent much of the week in the aftermath of Gen Con trying to catch up with the pile of mail and work waiting for us. We’ve also started making plans for our 2014 Gen Con booth, which will be bigger and offer more space for demos. A lot of work awaits us, so there won’t be a lot of basking in the fun of the past week, but we smile every time we talk about Gen Con. I hope those of you who attended Gen Con had a wonderful time too. I have to say, Gen Con has really become the premiere gaming convention. 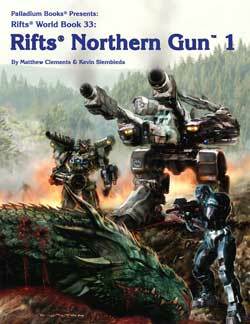 Try as we might, we were unable to get Rifts® Northern Gun™ One finished before Gen Con. We’re still catching up with email, correspondences, follow-up and business waiting for us when we got back. In addition, Wayne and Jeff both caught a bug at Gen Con and we all need to get some rest – not just from Gen Con, but the wild 3-4 weeks before it. Back at home and while we were away, Kathy caught some kind of bug that laid her low for several days and she’s still recovering. So far, I’m germ free, but feeling a bit worn out. I have been catching up on several business matters, but expect to dive into finishing up Rifts® Northern Gun™ by Monday. I’m already picking up speed as I write this today, after dragging for the last two days. There are pair of ads Wayne and I need to finish by tomorrow, correspondences to make, and a number of business matters to address, but then it is back to Rifts® Northern Gun™ One for both of us. Rifts® Northern Gun™ One is truly epic. I’m expecting to have it wrapped up by Labor Day weekend and to the printer quickly thereafter. It should take three weeks for the printer to get us the final product (a few weeks longer for the crowdfunded hardcovers). For those of you who can’t wait, check out the Advance Prototype Edition described below. 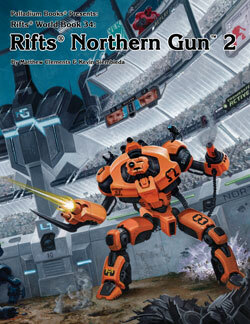 Rifts® Northern Gun™ Two is the very next title I dive into after NG-One. Much of the artwork is already done, and the rest is being worked on right now. Artists are working away and it will follow after NG-2. 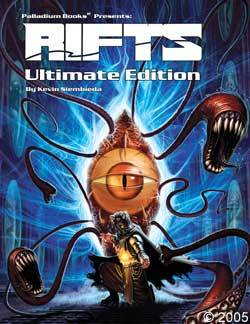 This is another dynamic Rifts® title that will leave you gasping and wanting more. Epic and coming soon. I want all four of the books above in your hands by the end of the year. 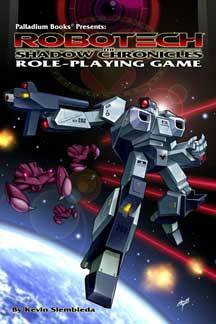 UPDATE: Robotech® RPG Tactics™ Pledge Manger – Ends/Closes August 31, 2013 – Time is running out! The opportunity to purchase add-ons and increase pledge levels is coming to an end. If you haven’t done so or confirmed your pledge, the next 10 days is the time to do so. Do not miss out. Remind your friends. At this point, almost 300 backers still have not logged into BackerKit to tell us how they want to apply the extra money they pledged! We just sent out another round of invites as reminders, but time is running out. You have only till August 31, 2013. Molds are being made in China. We’re still on track for a November or December release. The BattleFoam bags should be able to hold a full set of Battle Cry game pieces. We’ll try to have more news and details about this exciting product line in the next Weekly Update or two. That’s it for now. All our energy for the next few months will go toward getting long-awaited book titles finished and to the printer. I want the next four titles out by the end of the year no matter what. Northern Gun corporate background and info. 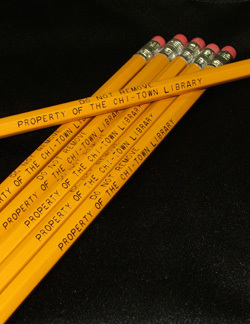 Descriptions of the Upper Peninsula and local region. 11 of the 23 combat/exploration robots (not counting drones and cargo haulers) complete with stats and descriptions; including the Super Explorer and Gunwolf. Hovertrain, notable characters and more. 136 pages – $17.95 – Cat. No. 887AP – available now! Only about 25 copies remain available.